ME! Is right, THERE ALL MINE!! There is no sharing here! 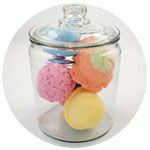 About the size of a scoop of ice cream, they smell heavenly and when dropped in the tub the rooms fills with a wonderful scent and your skin feels so wonderfully soft and conditioned! The price isn't bad either. I love to watch them fizzle and dissolve. I tried their sweet peppermint and WOW! Dropped it into the bath and the whole room was filled with the scent of peppermint. It is invigorating and picks you up. Most important, it will leave your skin soft and lightly scented. With all natural ingredients and made here in the USA. To buy one from the Me! Bath website is $8.50 and there is a discount for a multi-unit purchase.